Beyond the U.S. and Mexico, Canada reported the third-greatest number of H1N1 cases as of May 10. The Toronto Star, Canada’s highest circulation newspaper, published six front-page stories during the 12 days studied, a ratio of 1 story to 47 cases of the flu. The focus of the coverage in the Canadian paper, however, was quite different than that of the U.S. media—or most other media studied. There was a tendency to look for systemic issues about the flu, both its causes and its treatment, which was particularly evident in two of the pieces the paper produced. One connected the flu to the North American Free Trade Agreement. 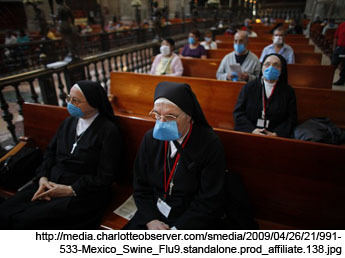 The other revisited lessons Toronto learned from the SARS outbreak of 2003. The NAFTA-related piece from May 1 began, “Sewage-filled lagoons at a pig farm in eastern Mexico- a product of the North American free trade deal- are suspected of creating ground zero conditions for swine flu in this country.” The article continued, “Environmentalists argue lax regulations in the factory farming that boomed in Mexico right after the 1994 North American Free Trade Agreement with Canada and the U.S. are making people sick—and not just with swine flu … You might call this the ‘NAFTA flu,’” said Rick Arnold, coordinator of Common Frontiers, a Canadian coalition focusing on Latin America and issues of economic integration.